DIE Jovis, 27 die Septembris. L. Morley versus Hastings, for an Assault. Hodie 2a vice lecta est Billa, "An Act for the naturalizing of Isabella of Nassau, Wife of the Right Honourable the Lord Arlington, One of His Majesty's Principal Secretaries of State." Their Lordships, or any Five; to meet this Afternoon, at Three of the Clock, in the Prince's Lodgings. ORDERED, That the Earl of Bolingbrook and the Lord Chandos are added to the Committee for Privileges, and to the Committee for the Journal Book. Hodie 1a vice lecta est Billa, "An Act for making void of several Conveyances and Assurances, made by Richard Hopton Esquire, Grandson and Heir of Sir Richard Hopton, late of Canon Froome, in the County of Hereford, fraudulently procured by colour of a forged Will of the said Sir Richard Hopton." This Day Knevett Hastings was brought to this Bar, as a Delinquent, upon the Complaint of the Lord Morley; who being charged with the Misdemeanors contained in his Lordship's Petition, he denied that he was guilty thereof. Whereupon it is ORDERED, by the Lords Spiritual and Temporal in Parliament assembled, That Mr. Ayliffe, One of the Justices of the Peace for the County of Midd. 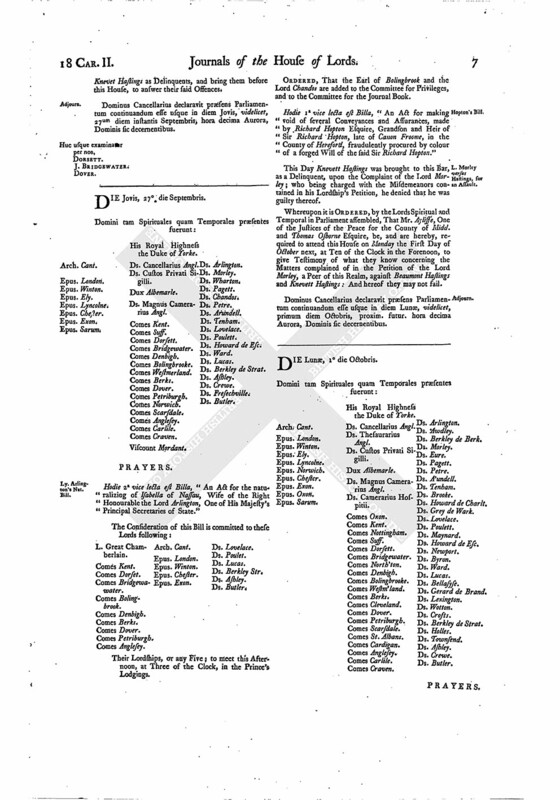 and Thomas Osborne Esquire, be, and are hereby, required to attend this House on Monday the First Day of October next, at Ten of the Clock in the Forenoon, to give Testimony of what they know concerning the Matters complained of in the Petition of the Lord Morley, a Peer of this Realm, against Beaumont Hastings and Knevett Hastings: And hereof they may not fail. Dominus Cancellarius declaravit præsens Parliamentum continuandum esse usque in diem Lunæ, videlicet, primum diem Octobris, proxim. futur. hora decima Aurora, Dominis sic decernentibus.